WEARE Meshech (1713-1786) was an American farmer, lawyer, and revolutionary statesman from Seabrook and Hampton Falls, New Hampshire. He served as the first President of New Hampshire from 1776 to 1785. Autograph Document Signed “Meshech Weare” 1pp. 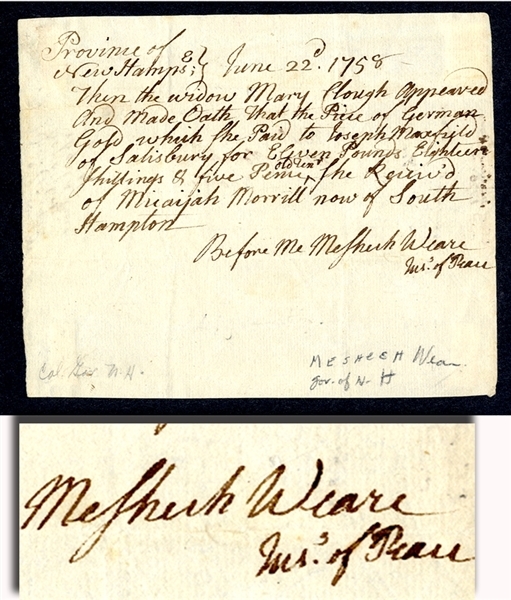 octavo, June 22, 1758, Province of New Hampshire, and reads in part: “...Then the widow Mary Clough appeared and made oath that the Price of German Gold which she paid to Joseph Maxfield of Salisbury for Eleven Pounds Eighteen Shillings and five Pence...” Mounted, else very good condition.